I admit it. When David Gray comes to town, I am the army wife whose husband has returned from war, the crazy lovesick teenager seeing her newly kissed boyfriend for the first time, I am as excited as a schoolgirl all tingly and giddy and silly and I can’t help myself. Judging by the screaming fans at the sold out show Saturday night, I guarantee that 99% of the woman/girls in the crowd felt exactly the same way. Many of the men too although a few looked like they were going through the motions for their dates/wives/husbands. One screaming fan told me after she ran down the aisle to stand next to us in our 2nd row seats(!) that she “got divorced over David Gray”. I am not sure what she meant by that although we high-fived as if she had just won the lottery; I am hoping it doesn’t mean she slept with him, since, well, I imagine that if David is going to stray on his beautiful model-wife, it wouldn’t be with this woman. But I suppose you just never know. The show began with the stage veiled by a gossamer curtain. David looked like an angel come down from high while the band played the first few notes of Fugative off his latest album, Draw the Line. When the curtain finally lifted, the crowd went wild. It became apparent at that point that this would be no ordinary show. The connection between singer and fans was almost immediate and wholly palpable. Throughout the almost 2 hour set Gray alternated between his guitar and piano bringing the crowd to tears as he dusted off some of his incredible older tunes including some from 1996’s Sell, Sell, Sell –when he was ironically selling very few records stateside and was still a relative unknown in the US. The first time I saw David Gray was thanks top my friend Sandy, who, just back from the South by Southwest convention, put my name on a list at Avalon to see this “incredible singer/songwriter” that reminded her in so many ways of Van Morrison. “White Ladder” was just released, an album he wrote, produced and created on his own in his house. I almost didn’t go to that show as it was a snowy St. Patrick’s Day and I did not want to be on the roads with a bunch of drunks. I am so happy that I did go, as I was introduced early on to this man who can turn a phrase and a chord change into something so beautiful that sometimes you think your heart will burst wide open…in a good way, of course. I almost didn’t go to the show Saturday either since it was the night before Easter and I had baskets to fill and tables to set, and pork roasts to stuff. Once again, I was so happy that I went. 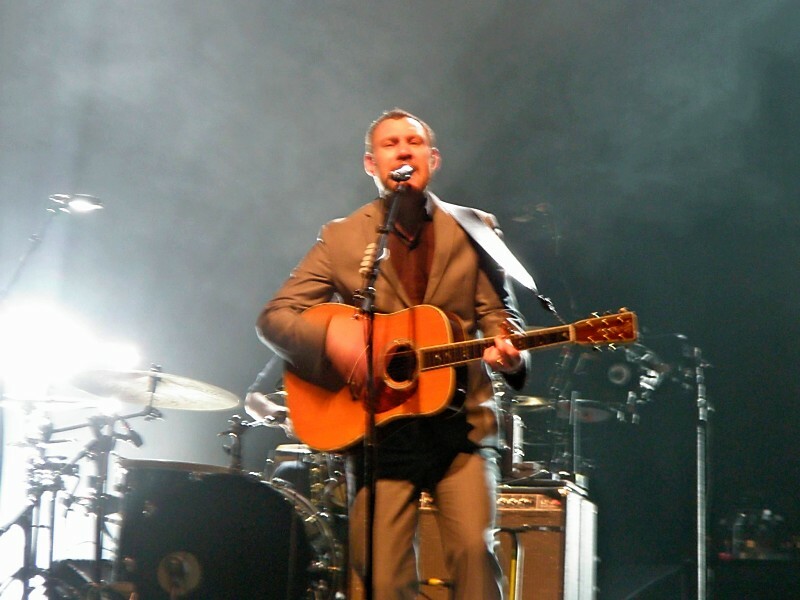 I have seen David Gray about eight times over the past years, once in London where we hung with the band members wives, a few times at Avalon, once or twice at the Wang, and just last fall at the Opera House. That show lacked a lot for me. Possibly because I was way up in the balcony but also because he left out so many of my favorites like “Shine”. There were other times he was not so great on stage. I saw him once at Avalon shortly after his father died and he stopped in the middle of a song and was visibly agitated with the audience. Somehow we had pissed him off. Not Saturday though. The love fest with the audience was so clear. This show blew the rest away. His classics like Shine and Everytime were juxtaposed perfectly with his newer material. Remember how I said that at a show I look for the “stellar” moment? Well, this show had so many stellar moments. David Gray’s sense of timing is uncanny. He never rushes through tunes like ‘Slow Motion” and “Aint No Love” hanging on to the last note of each stanza just long enough to make you want to scream but never too long to seem overdone. His extended version of Nemesis with his arms held out skyward was so incredible that Gina and I could do nothing but keep shaking our heads in wonderment at how amazing this man was. He came back for his encore obviously happy to be there with us and ended the show with a lengthy and toe-tapping version of “Please Forgive me” that had the entire house on its feet and singing. Oh by the way, I sing at David Gray shows. I sing loud and often –I can’t help it. I know it’s one of my rules to not sing at shows but when the whole place is singing it is difficult to stay quiet. Plus, his words, are just so, so, god-damned singable. Years ago, I met Mr. Gray at a back stage meet n’ greet at Avalon. Those were the days when I could still pretend I worked in the music business. When my turn came to talk to him I was so overcome with awe at how great I thought he was that I did the most ridiculous thing–I squeezed his face. Yes, that’s right, like an old Italian grandmother I took his face in my cupped hand and squeezed his face mumbling something pathetic like “Grrrr”. He looked a little taken aback, and most likely a little scared by this crazy woman grabbing him, but I could think of nothing else to do. I am still hoping for a second chance. I didn’t get to meet him this show, although we waited out back with the rest of the groupies until we got tired. But I did get the set list so I could make myself a perfect CD to listen to until the next time he comes around. 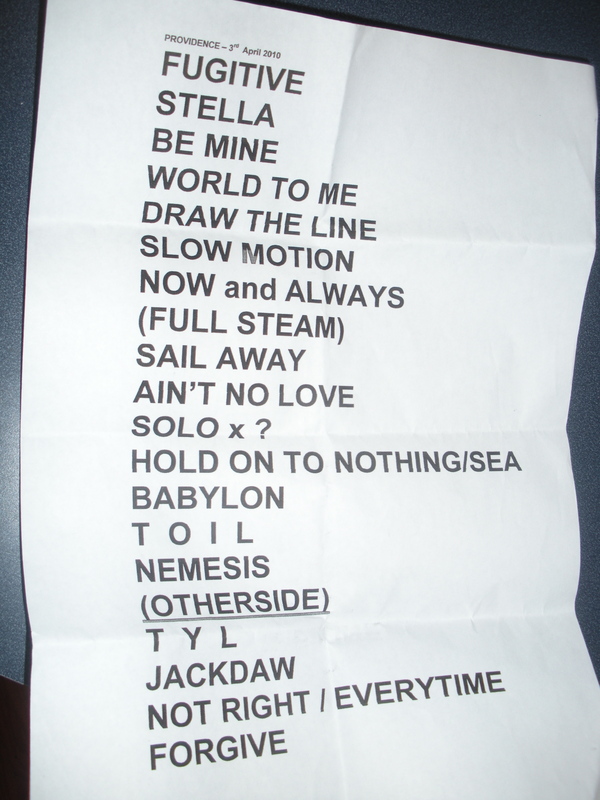 This entry was posted in Uncategorized and tagged Concert, David Gray, music review. Bookmark the permalink. I can’t tell you how much I enjoyed reading your review about David’s concert at the Providence Center this past Saturday night. I too was there, with my “groupie” friend Pam. We have also seen him many times in concert, Pam a couple more than me and we plan to see him again this August when he tours this area again. I couldn’t agree more with your post. This concert was hands-down the best! Mr. Gray was so into his songs and the crowd. I have never seen him interact and smile so much during a concert, it was wonderful! I too was one of those screaming fans singing loudly to EVERY song, on my feet dancing – as you stated, you just can’t help it! I can’t agree more, this was no ordinary show, he IS amazing and I hope when we see him in August he is just a wonderful. I am still on a high from the night.